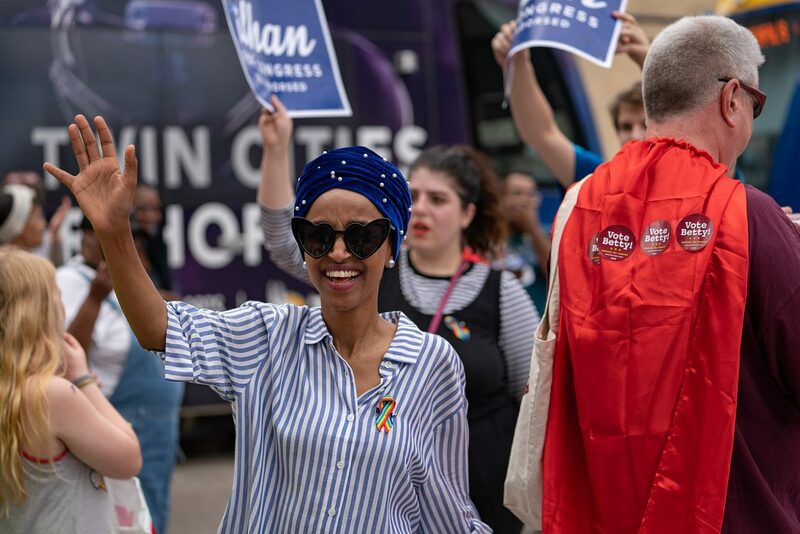 While it’s possible that Omar was alluding to Israeli Prime Minister Benjamin Netanyahu, whose political interests do align neatly with the GOP’s, the most straightforward interpretation of her tweet is that “Benjamins” refers to the vast sums of money that pro-Israel lobbyists have spent to ensure that critics of Israel like Omar and Tlaib have as little influence as possible. Omar’s point may have been incomplete or imprecise, but it’s a big leap to call it antisemitism. Unfortunately, it’s a leap many critics were eager to take, including the House Democratic leadership, which on Monday afternoon put out a statement condemning Omar and calling on her to apologize; she quickly did. This is a facile accusation. The Israel lobby, especially AIPAC, has long greased the wheels of American politics by bundling millions of dollars for campaign contributions and spending further millions on sending politicians and journalists on junkets to Israel, where they meet with government officials and absorb pro-Israel talking points under the thin pretense of a fact-finding mission. However earnest these groups may be about their support for Israel, they are explicitly in the business of trading influence for money. This isn’t limited to AIPAC; for instance, casino magnate and right-wing Israel supporter Sheldon Adelson and his wife Miriam spent $55 million in the 2018 election cycle to maintain Republican control of Congress. In recent years, the interests of these groups have dovetailed with those of Saudi Arabia and other Gulf monarchies, defense contractors, millenarian evangelical Christian Zionists, and other assorted war hawks. The Israel lobby is indeed a big tent, and it has welcomed in a wide range of right-wing interests that extend beyond the American Jewish community. It’s not surprising that many American Jews are on edge about antisemitism right now. The massacre at Pittsburgh’s Tree of Life synagogue was just months ago, and talking about Jewish-led organizations’ spending on political influence can easily veer into antisemitic territory. The tropes of Jewish control over politics to which Ungar-Sargon was referring are real, and she’s right that this is not the first time Omar has at least unintentionally invoked them. In 2012, during an Israeli military assault on Gaza, Omar tweeted that Israel had “hypnotized” the world, a remark for which she has since apologized. Plenty of voices on the left have criticized Omar’s language in good faith and called for more sensitivity or nuance, but none of what’s happening can be understood outside the context of the hypocritical smear campaign against her. Chelsea Clinton “co-signed” Ungar-Sargon’s tweet “as an American,” before engaging in a friendly Twitter exchange about Omar with a well-known racist activist (called out by critics, Clinton acknowledged her mistake). The American Jewish Committee called on Omar to “apologize” for a claim “demonstrably false and stunningly anti-Semitic.” McCarthy, who initiated this controversy to deflect from the actual white supremacist in his caucus, Steve King, urged House Democratic leadership to punish Omar for the tweet, which they eventually did. Never mind that just a few months ago, McCarthy tweeted that “we can not allow Soros, Steyer, and Bloomberg to BUY this election,” referring to three wealthy Jewish Democratic donors by name. This coordinated outrage should come as no surprise. Since Omar and Tlaib were elected this past fall, the Israel lobby has perceived them as a threat. The two Muslim women are the first-ever supporters of the Boycott, Divestment, and Sanctions (BDS) movement in Congress, and their vocal criticism of Israel points to a schism in the Democratic Party over the bipartisan consensus so painstakingly crafted by donors and pro-Israel activists over the past few decades. That consensus has held, in large part, because it has so effectively stamped out voices critical of the Israel lobby in progressive circles. In 2007, there was the successful effort to falsely smear Stephen Walt and John Mearsheimer’s book on the subject, The Israel Lobby and US Foreign Policy, as an antisemitic tract in the same lineage as the Protocols of the Elders of Zion. A few years later, former AIPAC official Josh Block was caught pressuring reporters to disparage critics of Israel at ThinkProgress as antisemitic. More recently, as Joshua Nathan-Kazis has reported for the Forward, secretive donors have spent untold millions on suppressing pro-Palestinian activism on college campuses.